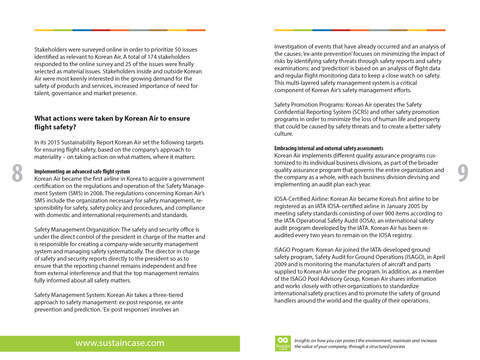 Air transportation has an inherent potential for massive human cas­ualties and property damages because it is exposed to a wide range of internal and external risks such as changing weather conditions, terrorist attacks, mechanical errors and errors at the control tower, in addition to accidents caused by human error. Korean Air owns a fleet of 148 airplanes and carries 23,270,000 passengers and 1.53 million tons of cargo per year. Flight safety is, thus, its top priority. 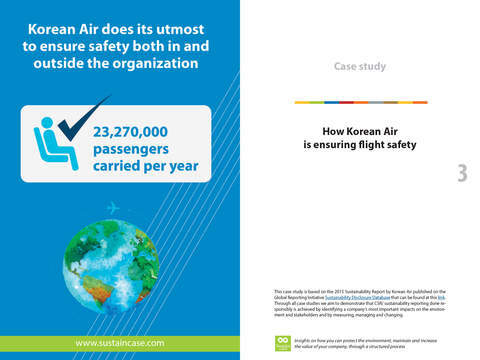 With the aim of becoming the world’s safest airline offering premium services, Korean Air does its utmost to ensure safety both in and outside the organization. 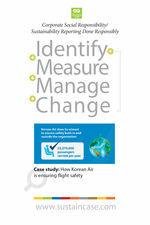 After measuring and setting targets, Korean Air took action to implement an advanced safe flight system, embrace internal and external safety assessments – for example, Korean Air became Korea’s first airline to be registered as an IATA IOSA-certified airline in January 2005 – and, also, better protect Korean Air’s passengers and aircraft through preventive actions such as collecting security information on all domestic and international destinations and issuing flight security grades for individual airports on a monthly basis.